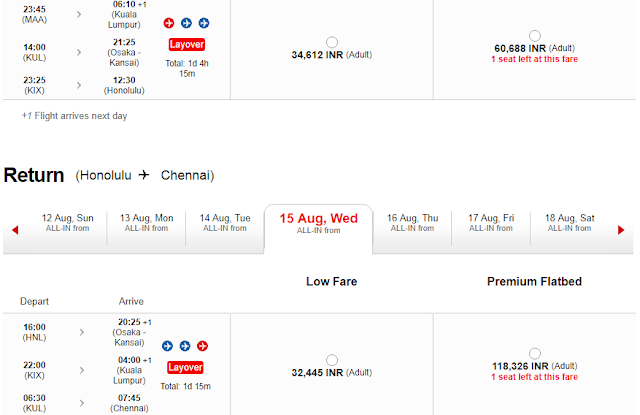 Home / airasia / airlines / airports / america / asia / destinations / india / AirAsia cheap flight to Honolulu US-Pros and cons! AirAsia cheap flight to Honolulu US-Pros and cons! As you may be aware, AirAsia has introduced a flight to Honolulu, USA. You can now reach US from India via KLIA2 and Osaka (Japan) with Air Asia. But for an Indian traveler, does this option makes senses? Would you fly to US with this Air Asia route? This post offers an analysis to help you decide. The destination: Getting regulatory permission to fly into US is a big confidence boost for the Asian low cost carrier. But there’s one problem. The destination Air Asia has chosen to fly to, in the United States of America, is very convenient (to fly into) but not very practical (from a US bound traveller point of view). Honolulu (capital of Hawaii state) is a small island far away from mainland united states. As a tourist: Hawaii is an island and offers beaches, watersports and related adventures plus a lot of memorials (including Pearl Harbor), art galleries etc. If island/beaches are what excites you, there’re lots of places closer and cheaper- Maldives, Mauritius, Bali, Thailand, Philippines etc. Not sure one would go to Hawaii spending 70k approx for return ticket and 30+ hours in travel each way. As a business traveler: If you’re not spending on your own will you prefer to fly to US with Air Asia? My guess is no. It is a long journey and you will need some food, baggage allowance and a more reliable route where if you miss a connection you don’t have to lose a full day. Hawaii is not the place where most business meetings happen (say compared to Silicon Valley or New York area), so I don’t see much reason why business executives will consider air asia. Whatever sale any airline runs, getting a ticket to the united states for under 50k is a near impossible task. Average fare is around 60k and one should be lucky to spot a fare in 50-60k range. AIrAsia’s fare to Honolulu also is around 70k. I missed to check their promo fare to Honolulu during the last sale. Best fare to Osaka Japan was around 22k return. Adding another 10-15k for Osaka-Honolulu leg, if you’re lucky you might get a return ticket to Honolulu for about 35-40k is what I am guessing – this is without checked in bag and food etc and if booked several months in advance. It is very unlikely that you can manage with a hand bag while going to or returning from US, so if you factor checked in baggage cost and food cost, the cost advantage over a conventional airline narrows down even further. At least for Indian travelers, flying to US via Air Asia is not really 'cheap' under normal scenarios. Only hope is to be able to bag a lower fare during a sale. If you plan to fly to mainland US from Hawaii factor another 30k for return ticket. Of course, this post is from an Indian traveler perspective. Air Asia flight may make lots of sense if you’re based in Malaysia or Japan or in a country that doesn’t have convenient flight options to US and Airasia is most convenient/shorter/cheaper. One alternate option could be to fly to Osaka or Tokyo Haneda using Air Asia's cheap fares and from there fly to mainland US directly using any other airline such as ANA or United etc. You will need Japan visa for this, which is not too difficult to get- details available here. Disclaimer: Fares are indicative, as seen online at the time of preparing this post.. Fares vary by dozens of factors, please check yourself for your preferred dates. What is your take? Do you find the Honoluru destination via Air Asia exciting? Do comment.